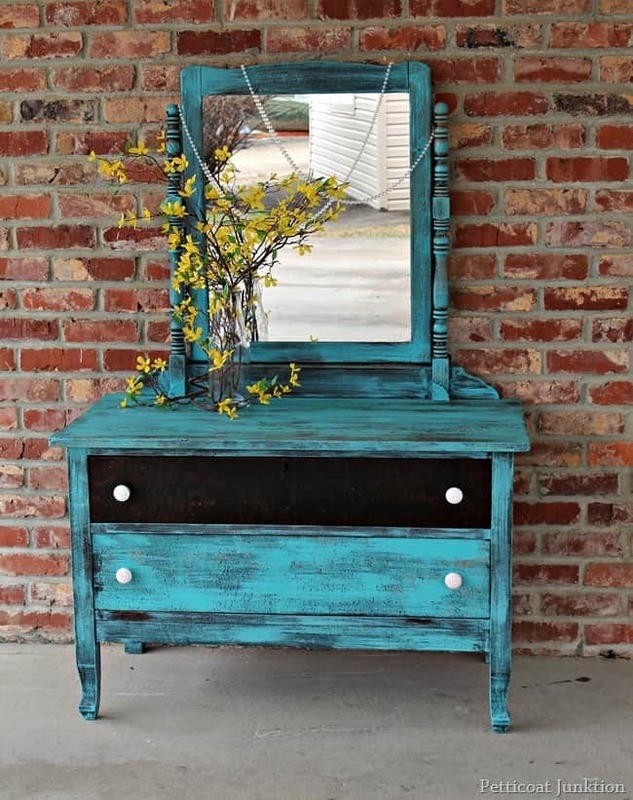 Junky to Funky- Vintage Dresser Painted Turquoise and Distressed With Simple Green. It’s hard to believe that this piece…. Remember the beat-up junky dresser a friend gave me? And this mirror came from the Nashville Flea Market. I mixed two of my turquoise paint colors together and brushed on some paint. As you can see I didn’t cover the dresser completely with paint. Now this is the part you will laugh at. I really hate sanding with a sander lately because of the mess. Sometimes I use a wet shop rag straight out of the can and wipe the paint off just after it dries. I was fresh out of shop rags so I grabbed a dry shop towel…sprayed the dresser with Simple Green and wiped off some of the paint. I can hear it now….you did what….doesn’t that hurt the paint…no it doesn’t. As I’ve said before….don’t be afraid to experiment. I have a hard time taking photos of mirrors. I was under the carport snapping these pics when the cold front started coming through. 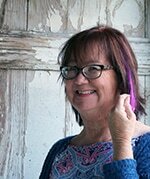 You can see my hair blowing in the breeze. I love the curvy details of the mirror holder. 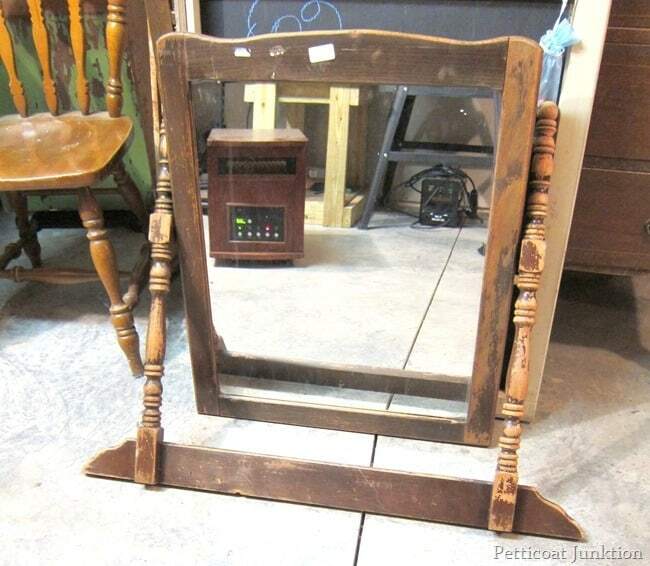 The mirror was only $10. I purchased the white knobs at Habitat Restore several months ago. Just because I like to be different… I didn’t paint the top drawer. I spruced it up with a coat of hemp oil. Total cost of project, approximately $12. Do you think I should paint the other drawer? You can leave me a little note below. What type of paint did you use to paint your piece? 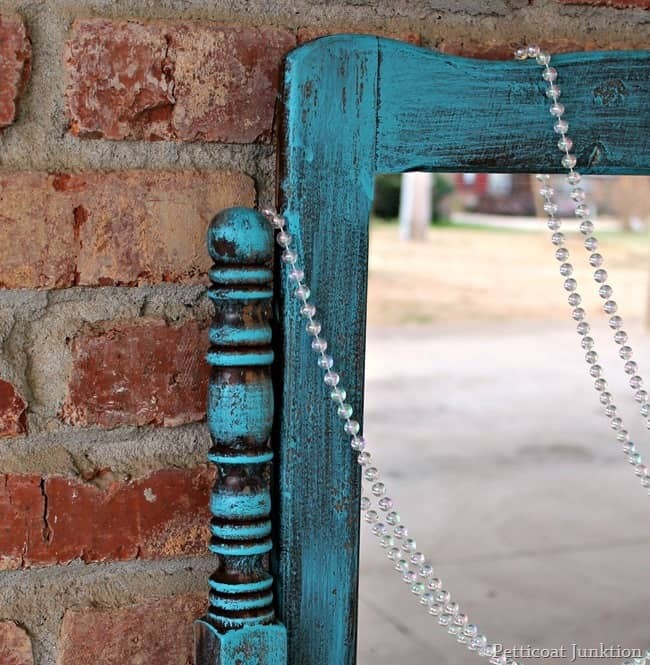 I just LOVE what you did with that old dresser and mirror! Great job! You have inspired me! $12?! That’s insane!! What a beautiful result. I love how you left the one drawer brown. 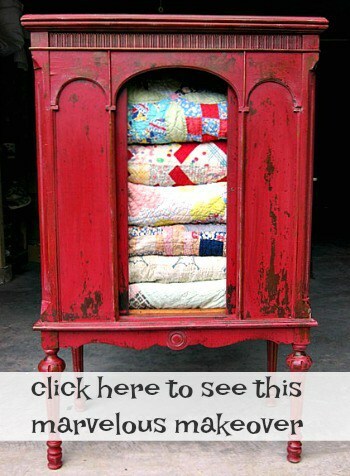 It is definitely what makes your furniture special – just doing something a little different! Don’t you dare paint that drawer…your magic looks perfect! Mirror pics are the hardest but nice to “see” you friend! Looks wonderful! I like it now, but think I would like it even more with both drawers the same. I love the color! Thanks so much for sharing Kathy!!! Love this pretty color! How in the world do you accomplish so much? I am impressed! I like the single “different” drawer. It keeps something from the original piece. Great Job! Kathy! What a piece! Love it and the drawer just the way it is right now. Funny thing is I’ve been “not into sanding” lately either. Something about it just doesn’t float my boat so I’ll have to give you little experiment a try! Love your word for 2014! What a fun little tip!! Wiping while wet…I’ve done a similar thing with Chalk Paint….wipe it away with a wet rag but it was after it had dried. I love the dresser by the way and WOW, now that’s a before picture!! I’m loving your “photobomb” of yourself! Can’t wait to see you in person!!!!! Thanks Beth, can’t wait for the visit either! 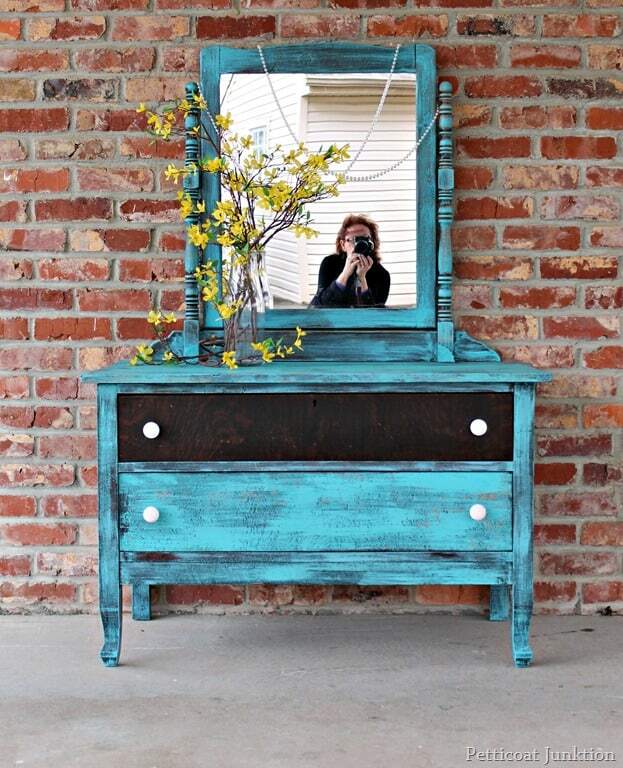 Love the color of this piece and I think it would look much better with that drawer painted. Just my opinion. Ha! Its getting there Chris but not all straight yet. You know what that means. I got it half way organized then started a project…. I love it!! I think the black drawer is just right! 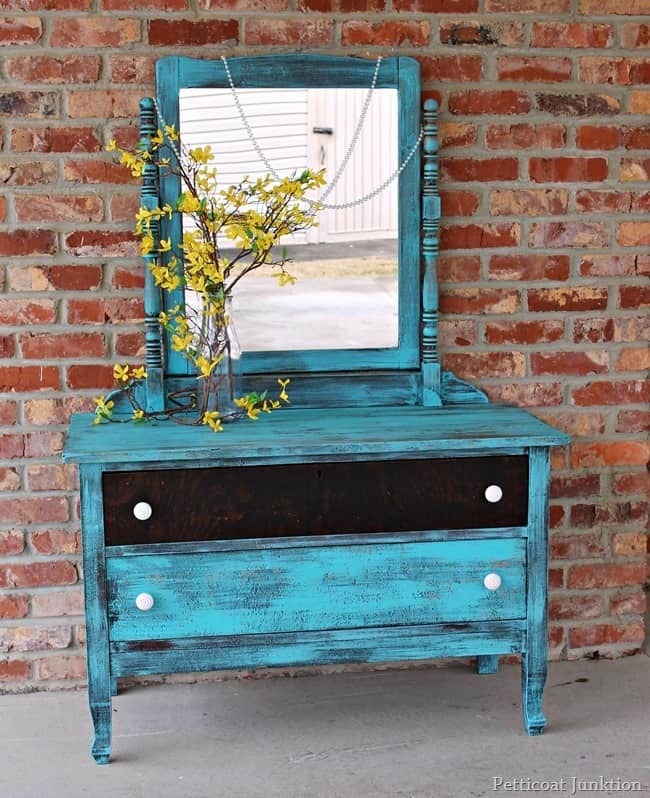 Love the way you painted it and with the white knobs, you just can’t get any better than this! I love that color so much. And yes I would paint the other drawer. boy, My husband said I should paint the drawer too. I really hate admitting he was right, lol. Turned out great! The mirror looks like it was always part of it. The one black drawer is kinda cool looking, but I think it would look better with both drawers in black or both drawers in turquoise. I think it would sell either of the three ways, though. 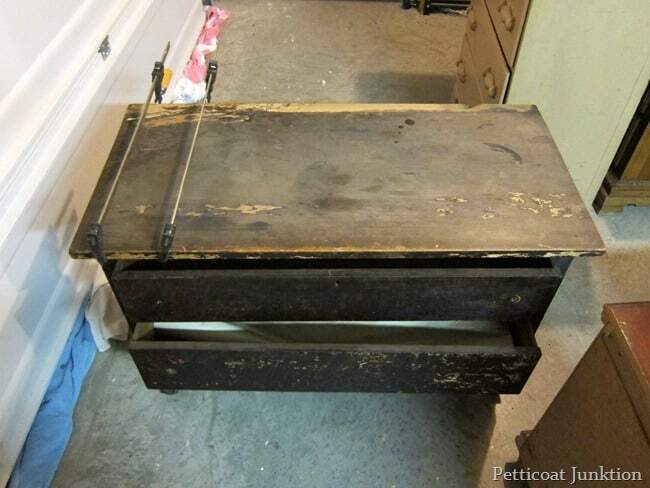 Great job what a transformation from the dresser your friend gave you and yes I think you should paint the drawer. Oh my gosh. . . I can’t believe this is the dresser your friend gave you!!! It looks magnificent- great job!Love the color you chose! Hello, I love the colors of the dresser, and yes I think you should pain the draw. I think it would look much better. You do wonderful work and I really have learned a lot from your site. I do have to ask why you used simple green instead of water, what difference does it make for the distressing? Debbie, I tried using water only but it didn’t take the paint off. I always have Simple Green on hand for cleaning the furniture and paint brushes so I sprayed it right on the paint and scrubbed!! Perfect. Love the top drawer! I love the drawer not painted. The dresser looks PERFECT as is. Awesome job.